Scroll to bottom of page to book upcoming Boating Events now. Be over 16 years of age. Participants under 18 years old must be accompanied by an adult (over 18). Be in a fit physical condition. Have wind and waterproof clothing & wear suitable footwear. Bring a fully charged mobile phone & a waterproof container to hold it. Sign in at the start and finish check points. Pay the entry fee in advance. Participants must bring any meals, snacks and drinks they require during the event. Participants are asked to be at the destination at the specified time to sign up for bus pickup. Before You Book you will need to decide whether you wish to participate in the event using a Canadian Canoe or a Kayak. Essentially, Canadian Canoes are large flat bottomed canoes catering for 2 people. They are easy to navigate and, thus ideal for those without previous canoeing experience. Kayak’s are smaller, faster and more nimble than Canadian Canoes. Kayaks can either be ‘Ride On’ or ‘Ride In’. ‘Ride On’ or ‘Sit On’ – you sit on top of they Kayak and don’t get into it (safer if it turns over, you just fall off). ‘Ride In’ or ‘Sit In’ – you get into the Kayak and consequently need a higher level of experience to operate it (in case it turns over, you need instruction on how to get it right way up again). NOTE: Not all events have Sit In Kayak’s in them. If it does not show up in the booking system it is because there aren’t any in that particular event. If in total doubt, go for the Canadian Canoe, if in doubt between Kayaks choose ‘Ride On’. See pics below to give a better idea. All Canadian Canoes take two participants (so if you are booking an odd number one will need to share) whereas Kayaks can be either single or double manned – both types are available and will be allocated on the basis of experience on the day of the event at the start point. Note: Booking Closes at 9pm on the day before the event so that we can calculate numbers for bus transport. 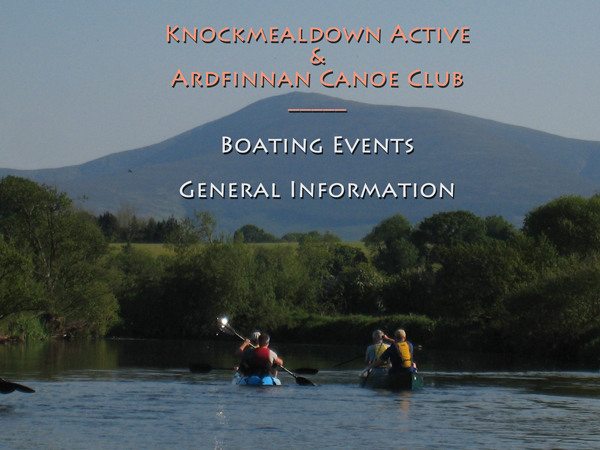 If you have any queries contact Will Nugent on sales@knockmealdownactive.com or call 083 177 2626.